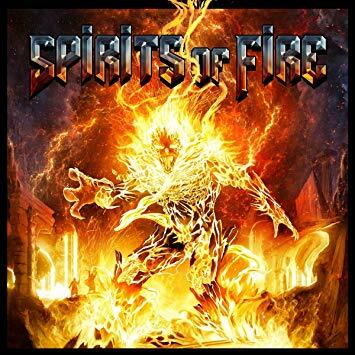 Metal super group Spirits Of Fire’s self titled debut album is a cauldron of prog, power and thrash metal that unfortunately is slightly generic. The quartet is comprised of metal legends Tim Owens, Chris Caffery, Steve DiGiorgio and Mark Zonder that are masters of their respective crafts. However, the band is too restrained on this record, dampening the excitement and preferring to play on cruise control. There are some solid tracks like “Temple Of The Soul” with its driving guitar riff and Zonder’s constant rhythm changes. Chris’s bluesy lead perfectly fits this track while Owens soaring vocals reach the heavens. The title track comprises of a stomping tempo that transitions to a rolling beat that encircles the listener before reverting to the main riff. The song twists and turns but moves forward with standout guitar leads and interesting time changes. However, other tracks fall short like the seven minute long song “The Game” which is both platitudinous and tedious. The track is a run of the mill epic metal track that falls short of the band’s potential. These guys played in bands like Judas Priest, Death, Savatage and Fate Warning, thus the bar is high when it comes to creating epic metal material. It is a downer when the band play it safe and sound like an above average American progressive metal act. Album closer “Alone In The Darkness” redeems this record albeit slightly with a somber clean guitar riff, however Owens’ vocals fall a bit flat which diminishes the power on this track. Spirit Of Fire were burdened with the expected task of releasing a high quality metal album. Sadly, the band play it self and there are few ear grabbing moments on this record. Steve DiGiorgio is one of the greatest metal bassists and his role is greatly diminished. Tim’s vocals vary track by track as he sounds great on one track but drowned out on another one. Caffery’s guitar work is the one consistent element on Spirits, a pity as it suffers due to naff songwriting. Spirits Of Fire sadly does not live up to its title. There are some fiery moments on the record, but ultimately it is by the numbers prog/power metal. It is a shame as Spirits have the potential to play some ear ripping metal. Perhaps the band will pull out all the stops on its sophomore effort.